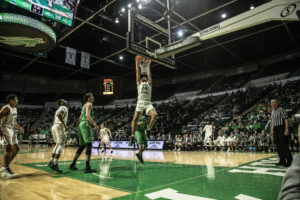 North Texas men’s basketball (20-4, 8-3 Conference USA) defeated the Marshall Herd (13-11, 6-5 C-USA) 78-51 on Thursday night at the Super pit, giving the Mean Green their eight conference win and 20th overall win of the season. “They were who we wanted to beat,” sophomore forward Zachary Simmons said. This is the most wins in 24 games by the team since the 1975-76 season and their quickest 20 wins in school history. 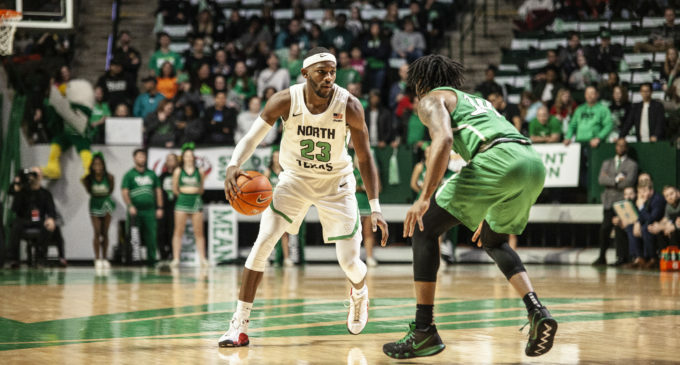 North Texas had four different scorers in double-digits, including junior guard Roosevelt Smart, who started the second half on a 9-0 run by himself, making three consecutive 3-pointers. Smart led the game, scoring 20 points and a double-double with 10 rebounds. 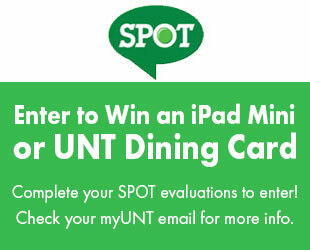 North Texas led on the boards, out-rebounding the Herd 55-30. The Mean Green took control of the offensive glass as well with an 18-5 advantage. Sophomore Zachary Simmons dunks after a pass from junior guard Ryan Woolridge at the game against Marshall on Feb. 7, 2019 at the Super Pit. Image by: Trevon McWilliams. Simmons scored 20 points on 8-of-9 shooting to go along with his 11 rebounds. “Guys stepped up and made shots today and that was the key to our win,” Smart said. Redshirt freshman Umoja Gibson put in 19 points, four rebounds and three assists. Junior guard Ryan Woolridge scored 15 points, six rebounds and five assists. He set a new season high with three made 3-pointers. The Mean Green went 12-of-28 from deep, out-shooting the Herd 43 percent to 21 percent from behind the arc. North Texas came out hitting shots early and continued the trend the rest of the game as the team shot 44 percent from the field to the Herd’s 28 percent. Senior guard Michael Miller had a career-high in rebounds with 13 boards. This is the Mean Green’s 8th win in C-USA keeping them in competition for first place, as they’re currently one game behind first place Old Dominion. With three games remaining, North Texas is in position to compete for first place in C-USA. UP NEXT: The Mean Green will host the Western Kentucky Hilltoppers (13-10, 6-4 C-USA) at 5 p.m. on Feb. 9. Featured Image: Mean Green senior guard Michael Miller begins his drive against a Thundering Herd defender at the game against Marsall on Feb. 7, 2019. Image by: Trevon McWilliams.